Lightfair 2018 has come and gone. The world’s largest annual architectural and commercial lighting trade show and conference ran from May 8-10, boasting over 500 exhibitors. While we have not seen 2018 numbers, Lightfair has previously seen over 28,000 registered attendees – not your average audience. As a “global presentation of light and technology,” the show draws the attention of architects, interior designers, contractors, engineers, manufacturers, and other stakeholders across the world’s construction industry as a destination to gain insight on the current and future direction of lighting design and technology. Having been there ourselves, it’s not hard to see why. The show floor is like something out of a dream, with everything from casual residential fixtures to large-scale commercial behemoths, illuminating every inch of the show floor with every color of the visible spectrum. If you’re not careful, you’ll feel like you’ve nearly blinded yourself at every turn down the show floor – and yet, somehow you don’t mind. Surrounded by so much brilliant design at once leaves little choice but to feel somewhat awed. 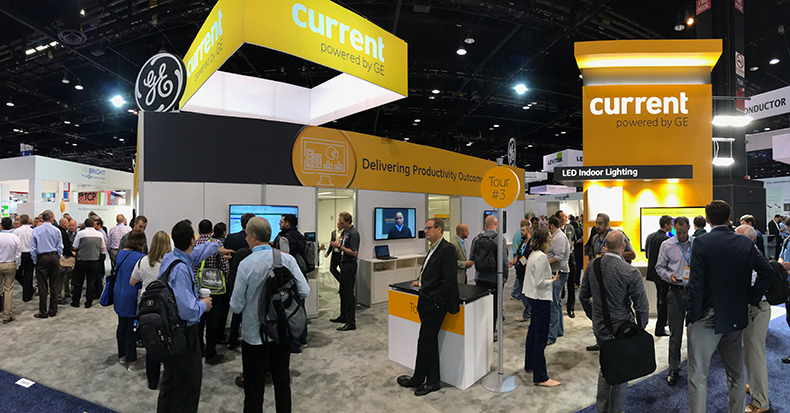 Our team of architects walked the floor all week, ducking in booths, watching demonstrations, and getting a feel for some of the most intriguing and impressive innovations in lighting in 2018. We saw so many fascinating and inspiring products that we just couldn't go without sharing some of them. 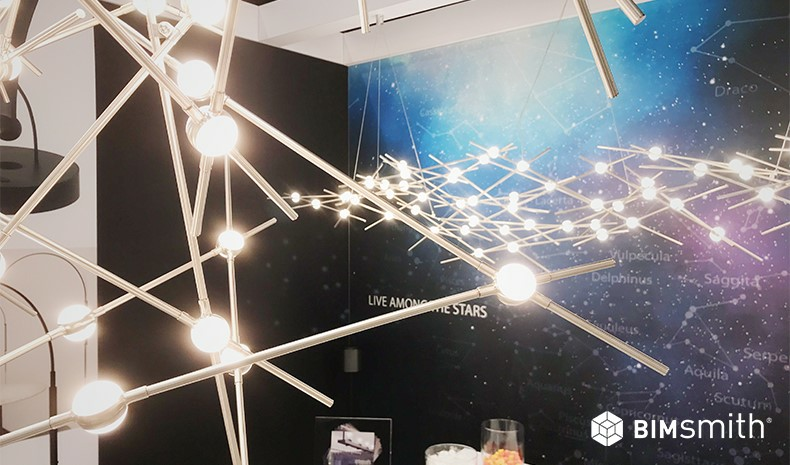 So, we decided to put pen to paper and give you the top products we loved at Lightfair 2018. 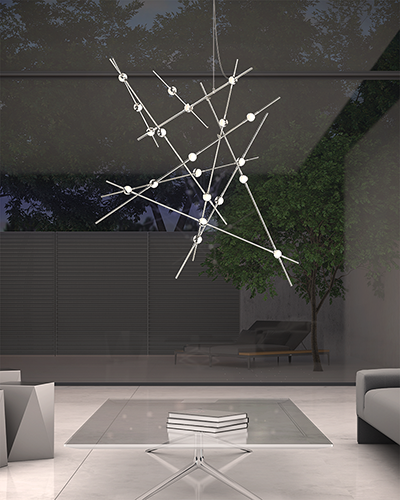 New from PureEdge Lighting, the Pipeline 1 LED Suspension is an energy efficient modular indoor lighting system that pushes the angles of geometry in unique and creative ways. Designed to complement a modern aesthetic, the Pipeline mimics the shapes found in most open-ceiling spaces, blending well with existing pipes and ducts, rather than following the traditional square design that most modular systems offer. For an extra touch of brightness, you can also build the system with adjustable 24VDC track heads and pendants, creating the perfect combination of direct and indirect lighting sources. 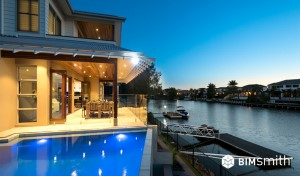 PureEdge design openly embraces that lighting can no longer be viewed as one-size-fits-all. 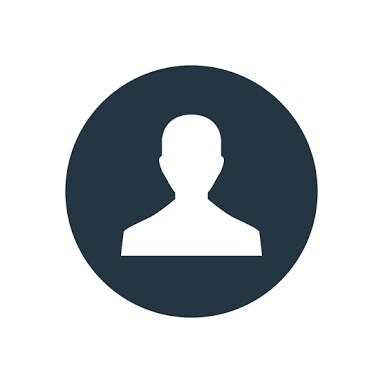 Every space has unique needs, and PureEdge aims to stay at the forefront in the development of custom solutions to match those unique needs with products like Pipeline. 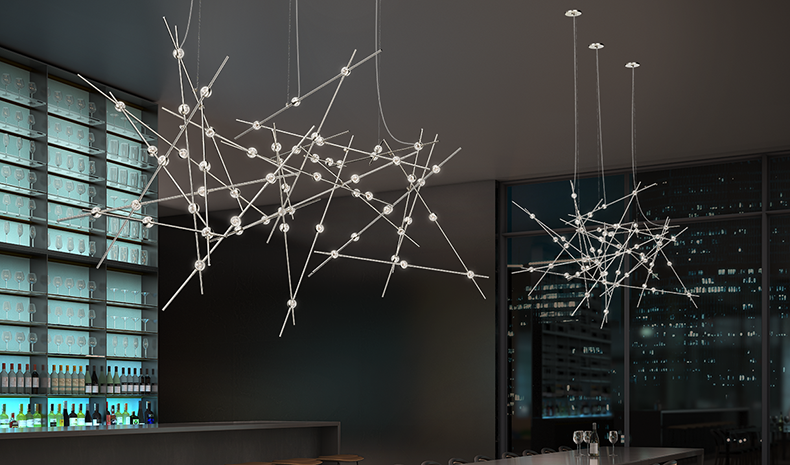 Connecting hubs are driven by multiple LEDs, and light emits via smooth white domes or micro-faceted diffusers. 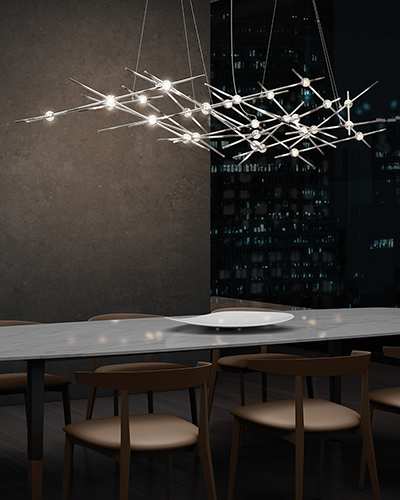 Designed after real constellations Aquila minor, Aquila Majoy, Ursa Minor, and Ursa major, Sonneman has accomplished an other-worldly atmosphere with this latest design. 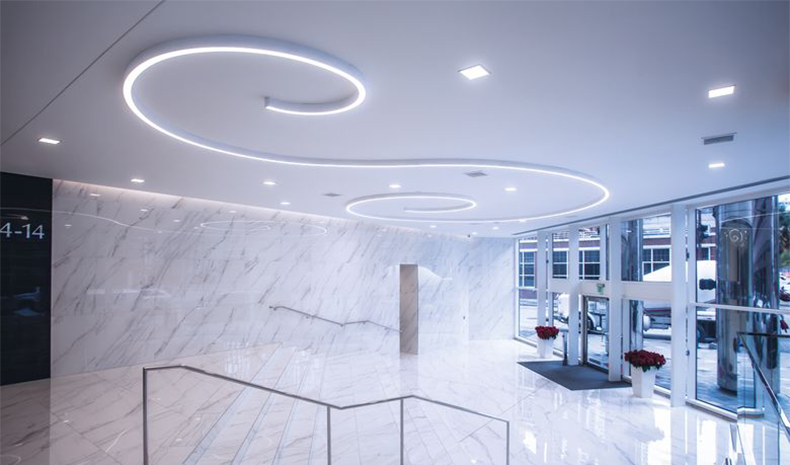 Hess America’s PORTAL adds a striking visual accent to feature spaces with linear simplicity juxtaposed with a unique circular aperture. Functional bi-directional illumination from concealed LEDs projects light through the clear acrylic ringed lens to produce a corona effect without the appearance of individual diodes. 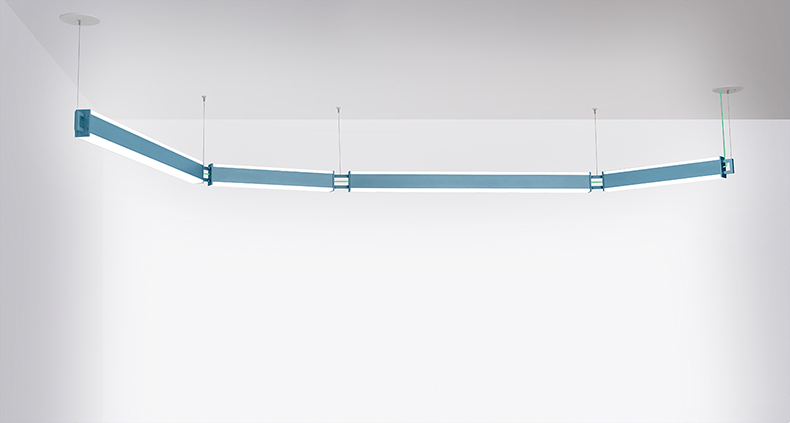 The 8’ or 10’ column may include optional marker lights on either side at the base to provide supplemental pathway or area illumination with either diffused or controlled optics. 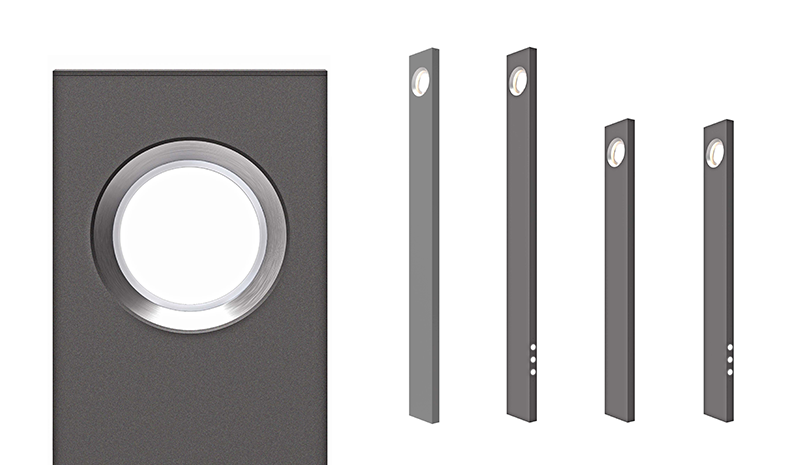 The concealed mounting plate assembly delivers a clean, flangeless appearance. 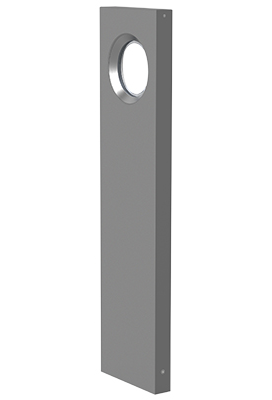 Hess has also designed the PORTAL Bollard to complement the PORTAL Column. PORTAL was given the Best in Category Award for Sports, Step, Landscape, Pool & Fountain Luminaires at the 2018 LFI Innovation Awards held on Tuesday morning. 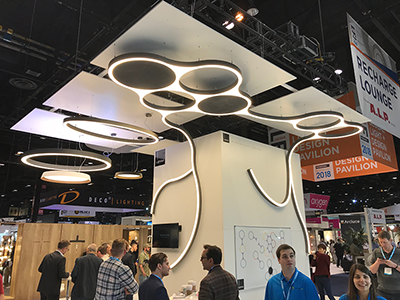 Los Angeles-based Prudential Lighting took the opportunity at Lightfair 2018 to unveil a series of new patterns to be added to current product models. The Sky Oculus series is a set of patterns available for both the Prudential P4000 Sky Rounds and the Euro-styled Quad lighting products. The Sky Oculus series will launch in the summer of 2018 with the availability of three standard designs: Nairobi (pictured above), Madrid, and Marrakesh. Customization is also an option for those looking to personalize their space even further. Note: These patterns are set to launch in the summer of 2018. In the meantime, browse the current availability and application photos for the P4000 Sky Rounds and Quad models. 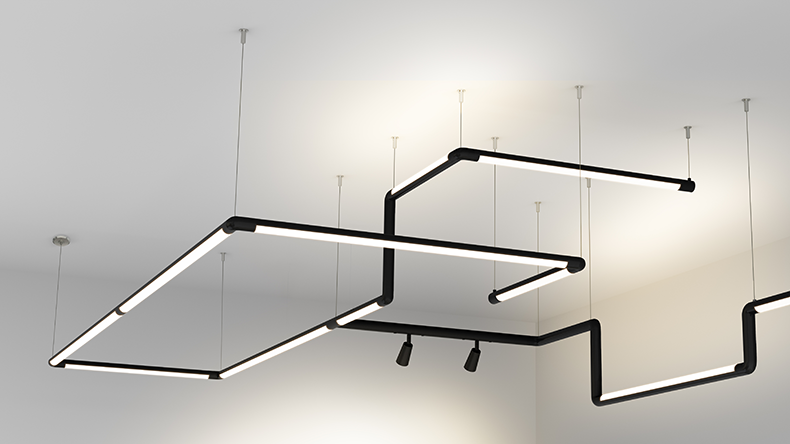 PureForm is a complete site and area lighting family with a cohesive aesthetic that brings continuity to a site. The family includes a bollard, post top, wall sconces and medium and large area luminaires, with stylish designs that blend with architecture. Comfort optics are available with the post top, wall sconce, and medium area, which reduce glare to enhance visual comfort. The entire family can be integrated with a range of control options to easily connect your entire site. 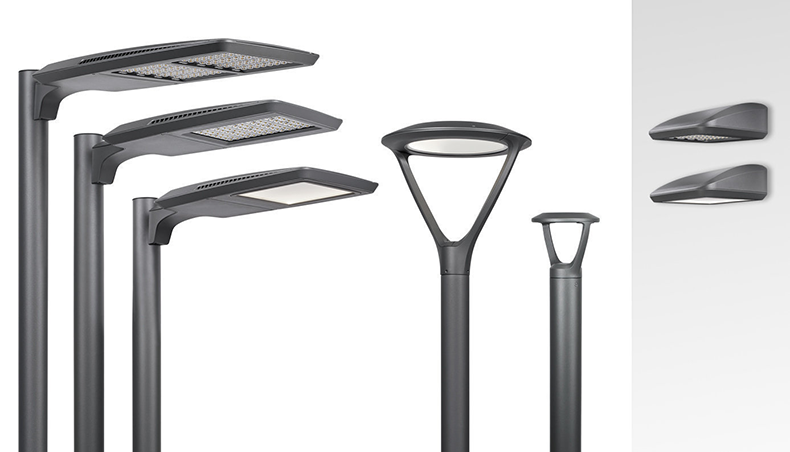 The Philips PureForm series was given the Best in Category Award for Parking, Roadway and Area Luminaires at the Lightfair 2018 LFI Innovation Awards. 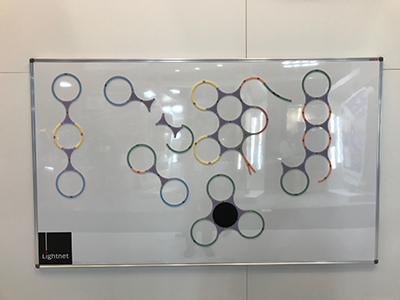 The Lightnet Architectural Lighting display was one of the most intriguing at Lightfair, because it featured the stunning Liquid Line 3D series gracefully curving its way around the booth, turning corners and making loops, and then gave attendees the chance to use magnets to discover how the individual elements can connect together in all different combinations and patterns. If the sleek and slender fixtures didn’t draw me in at first, the inner child in me did, urging me to design something unique for myself on the magnetic board. Liquid Line elements are available in white color temperatures, across several styles including Curved, Linear, Bend, Wave, and X- and Y-Junctions. One of the many compelling technologies displayed by Current by GE comes from their Indoor Lighting line. GE LED tubes, which offer 2.3x longer life (70,000 hours over 30,000 hours), use 43% less energy (18W and 2600 lumens vs LFL 32W and 2800 lumens) than traditional tubes. Designed to fit in fixtures intended for linear fluorescent lamps (LFLs), LED tubes from GE offer a smart, efficient and long-lasting solution to replace traditional lighting. GE offers three solutions: UL Type A, UL Type B, and UL Type C. These are offered in various lengths and sizes, including T8 and T5, as well as in glass and plastic. This Lightfair, Visa Lighting placed a strong focus on their recent partnership with healthcare solutions company Vital Vio to introduce a series of LED disinfection fixtures with a wide range of applications. Vital Vio’s VioSafe™ White Light Disinfection™ technology continuously protects environments from harmful bacteria. 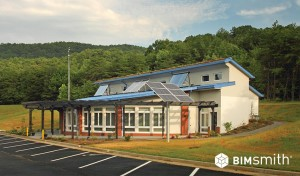 With a handful of patents awarded and still more pending, research shows that Vital Vio’s products can dramatically reduce contamination and infection risk in facilities where sanitation matters most, like hospitals, athletic training facilities, dining areas, daycare facilities, public restrooms, hotel suites, college dorms and more. Areas that use Vital Vio's patented technology can see up to 90% reduction in overall levels of harmful bacteria (like MRSA, E. coli and Salmonella) in as little as 14 days. Visa Lighting took the opportunity presented by Lightfair to introduce the first-ever luminaires developed through the partnership, including Cade, Jasper, Symmetry, Latitude, and Catena. Focal Point has revisited its classic Skydome – a name perhaps familiar to many in the industry – with the new Skydome Edge series. 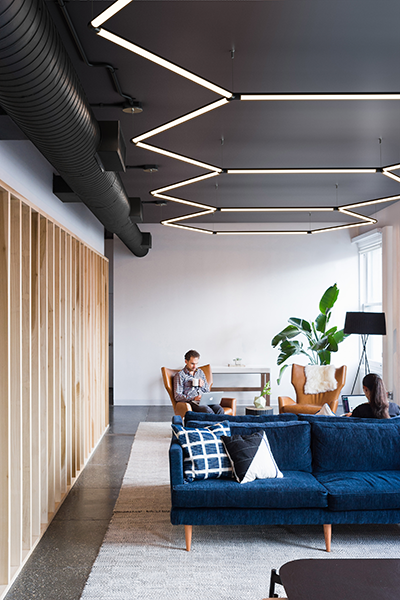 The series pairs edgy, low-profile, edge-lit luminaires with unlit sound-absorbing complements to combine visual and acoustic comfort in any setting. Both luminaire and acoustic members of the Skydome Edge series come in 2’, 3’, and 4’ models, which coordinate together for a look that is both sophisticated and comfortable. 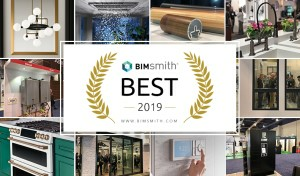 Get in touch with us at +1 (224) 484 - 8896 or sales@bimsmith.com to learn more about BIM content creation or to get your building products on the BIMsmith platform.